Lowdown: The daughter of a tiny people’s family, living in hiding under humans’ house, is discovered. 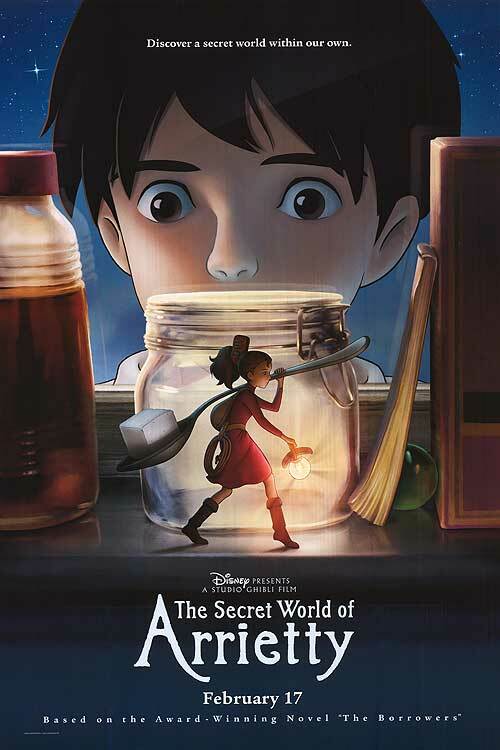 The Secret World of Arrietty, or Arrietty for short, belongs in that special niche of green Japanese animation movies. A niche made famous by the likes of Princess Mononoke, Spirited Away, Howl’s Moving Castle and Ponyo. The key difference is in Arrietty being directed by Hiromasa Yonebayashi, who held animator roles in those previous films; however, other than that name change, you would be hard pressed to tell the difference. Not that there is anything wrong with that, though: I consider these films to be a perfect hit with the adult children market. Nothing bad with being thought provoking as well as entertaining and appealing to the kids! Arrietty takes place at a rural house, where daughter Arrietty lives with her parents under the floorboards. They are the last of their kind, tiny English speaking (for the sake of our five year old we watched the English dubbed version) humanoid people. All the rest of their keen, our little family believes, fell victims to the ever expanding humans. This is why the sighting of Arrietty by a young human boy coming to rest and relax at the house is a disaster: can the family now continue to make its living out of borrowing small things off humans, or will they have to seek their fortunes elsewhere? Using colourful and magnificient animation – nothing like the computer generated stuff we’ve grown accustomed to see – Arrietty tells a touching story filled with adventure. Aided by well designed sound, Arrietty packs a punch that is entertaining as well as enjoyable. The green themes for which the genre is famous are as obvious as the great animation, and should hit home with a generation of kids growing up on iPads and fake grass. Best scenes: I particularly liked the Prince of Persia like scenes where our tiny heroes managed around the humans’ house. The movie really does make the most of this for its own type of action scenes. That said, there is plenty of worthy drama in there, too. Overall: Perhaps we can claim to have watched this film before by now, but regardless – Arrietty is a good all-around movie that is very well made. 3.5 out of 5 stars.